Shanna Germain’s The Poison Eater took me, delightfully, by surprise. Talia is a young woman just hoping to live another day. She survived her youthful days in a far city and has come to Enthwait where she has joined the ranks of others vying to become the new Poison Eater – a revered member of the elite society; a protector of the city. But to do this, she must take a dose of a different poison periodically until she has survived them all. The other Poison Eater hopefuls around her die regularly with each new ‘feeding’. Talia has no idea if she’ll survive and is surprised each new day when she wakes again. The poisons may not kill her, but they do often have a negative effect. But as Talia nears the end of the list of poisons she is visited by the current Poison Eater, a man who reveals a dark secret about the role of Poison Eater. Talia now faces new choices and decisions that will affect not only her but the entire community as she prepares to take on the role of defender as Poison Eater. The story is told through Talia’s eyes and author Germain gets into her head and makes this story a very personal one. Although an entire community is at stake, how one person comes to make the decisions that she does is what we see and feel. I very much liked this method of story-telling. The greater story comes in to focus so much clearer when we see its effect on an individual who has made sacrifices to get where she is. There is a real power in this story-telling and I really enjoyed getting to know Talia and her journey. I did not know what “A Numenera Novel” meant. I assumed it to be a forth-coming series by Germain. But I’ve since learned (after reading the book) that this is based on a role-playing game. Truthfully – had I known this before I started the book I probably wouldn’t have bothered. I don’t know the game and too often I’ve found books based on games tend to be a little simple and/or rely on the reader to know about the history established in the game. I don’t feel this was the case here. This was a delightful read. The story was intriguing and the characters were quite real. 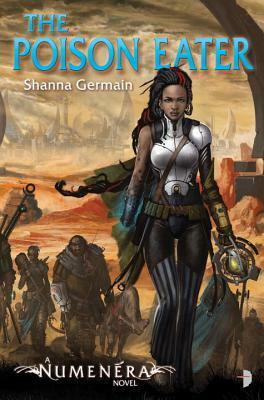 I definitely want to read more in the Numenera series and I want to read more by Shanna Germaine. And though I consider myself a game-enthusiast, this has not made me interested in playing the game. Looking for a good book? The Poison Eater by Shanna Germaine is a well-told science fiction story of survival and lies and the making of a life that pulls a reader in. It is based on a role-playing game.